Flexible enough to perform quartet work or anchor the front line of a big band, the Selmer 55AFJ baritone saxophone features a range to low A, adjustable thumb rest, blue steel springs, and leather pads with metal boosters. The clear lacquered brass body of the Selmer Series II baritone saxophone is also beautifully engraved. It's complete with wheeled case, Selmer Paris mouthpiece, and cap and ligature. 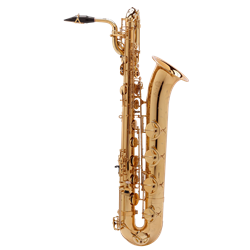 The Series II sopranino, soprano, alto, tenor, bass and baritone saxophones have been the professional choice for a generation and continue to be the most popular professional saxophone in the world. The reasons are clear: they all possess a flexible but centered tone that is natural in almost any playing situation. Yellow brass body tubes and keys resonate across the entire timbre spectrum: full-ribbed construction enhances their durability. The Series’ superior intonation characteristics make these saxophone a natural choice for any professional or those who aspire to be. FEATURES Range to Low A, Hand engraved bell, Clear lacquered brass body construction, High F# Key/Low A/Tilted Bb Spatula Key, Power hammered keys, Metal resonators.. FREE SHIPPING with your purchase today!